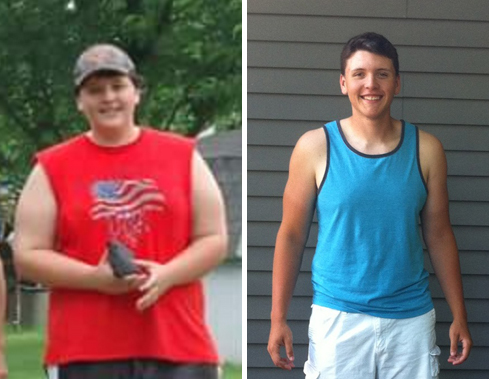 Physical education major Sean Conro before, left, and after losing weight. Sean Conro, a sophomore physical education major from South Elgin, knew in high school he had a problem with his weight. When his grandma passed away in her early 60s from a rare liver disease complicated by type II diabetes, he began to think about his own situation. At nearly 350 pounds, Conro hadn’t paid attention to the health risks of carrying so much weight. Once he decided to take action and start losing weight, his parents began to help by focusing on food preparation and portions. His mother suggested they should do it together because she also wanted to lose weight. Conro’s dad transformed a closet door in their home into a place where it was easy to keep track of his progress on a weekly basis. At the end of each week Conro weighed himself on the same scale at the gym where he worked out to assure the accuracy of the measurement. Together with his dad, they would update the closet door with the new date and new weight. Charting the progress in this manner was both satisfying and motivating to Conro. The best moment, however, was when his best friend noticed Conro’s profile one day at the movie theater concession with a look that said “Dude, have you lost weight or something?” That “look” was a clear acknowledgement that the hard work was paying off. As a freshman at Illinois State Conro’s Personal Fitness class with Professor Jeff Williams underscored the health risks of being overweight as well as how the nutritional value of foods could help or hurt your body. Over the course of two and a half years Conro lost 160 pounds, before spending another year and a half toning his body to address the loose skin that remained. He also formed a GoFundMe site to help pay for the mini abdominoplasty surgery which removed excess skin in his lower abdomen. Today, Conro weighs in at a fit 215 pounds. Conro appreciates the physical education faculty in the School of Kinesiology and Recreation because it is their job and passion to help people understand the importance of movement and healthy choices. He wants to do the same as well as help kids who are fighting obesity because, with the right help and support, anyone can do it.